← I think I can….. Always good to have a plan B. Hope the hamstring pulls up well after all that speed. There wasn’t too much speed Ewen. Just marginally faster than “slow”! And I see Brad tomorrow for the needles in the leg session. A favorite, not. I’m just hoping that this isn’t going to happen too often. Then I’ll get really cranky! 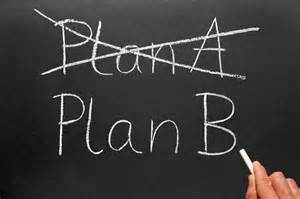 I have learned too late to have a plan B.